Whether you are a job seeker, recruiter or currently employed, it has become increasingly important and beneficial to build your social network. Taking the extra time to personalize your opening message on LinkedIn can make all the difference when standing out and creating solid connections. Allowed only 300 characters, it is important to focus on your goal and the similarities between you and the person you are trying to connect with. 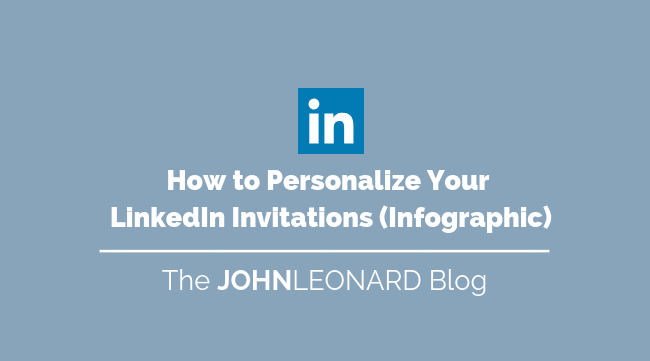 The following infographic displays successful ways you can personalize your LinkedIn invitations so that you will be more likely to receive a response and build your robust network! This post was originally published on the JOHNLEONARD blog and written by Erin Bazinet. Use our Job Seekers Survival Kit to survive your next Job Search.